What is the Law of Attraction all about ? Law of Attraction is a Universal Energy bringing you more of whatever it is that you are thinking, feeling and doing, both consciously and subconsciously. In simple words,We don't just Participate in what we experience but rather we are fully Responsible for what shows up in our life and we do so with the Thoughts we Think and the Vibrations we emit. Therefore, when we start becoming Conscious of What we put out into the World and start learning the art of raising our Vibration we will be able to manifest our dreams and Attract what we want! 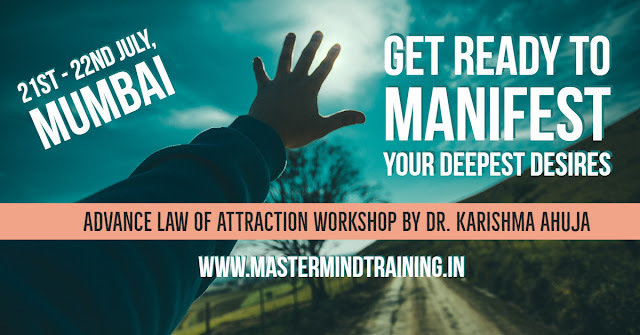 This Workshop is a combination of scientific, metaphysical & spiritual elements to understand and apply this powerful law to every aspect of one's life so that we connect with what we consciously want to create in our life. • Special exercise to develop your intuition . • Quantum Physics: Scientific theories of how the law of attraction works, how the Universe is linked to our thoughts, how we can create our own Reality through our Observations and Assumptions.